SCHOLASTIKA (Bryansk, Russia) � alike with its noble medieval name � is an old band. Moreover in terms of underground the band members are old enough to be fathers or even grandfathers of their listeners. Following two years (1989-1990) under the name TRETIY VAVILON (The Third Babylon) the band changes its name in 1991. The original line-up consists of Yury Volosatov (vocals), Dmitry Makagon (drums), Vladimir Ruchkin (bass) and Ruslan Murzinov (guitar). 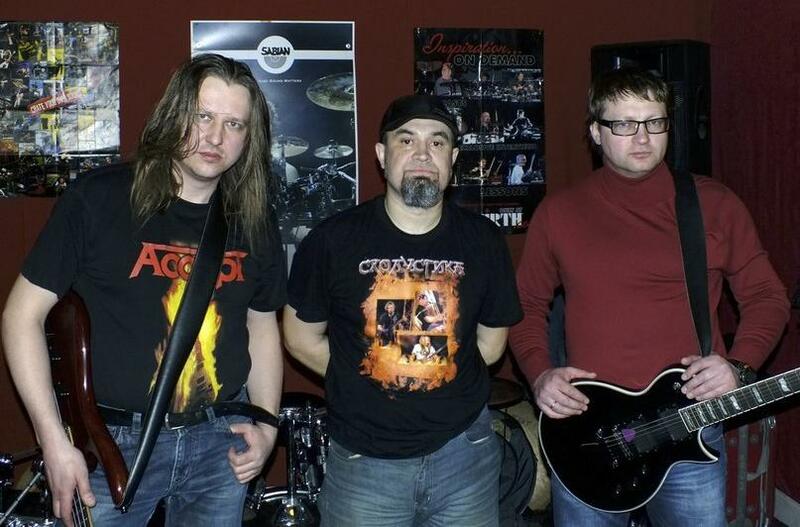 Being the only thrash metal band in the Bryansk Region, SKHOLASTIKA right away comes up to attention of metal fans. In 1992 the band moves from Bryansk to Dyatkovo, where the new line-up (Murzinov remains the only original member) gives a boost to its progress. With Vladimir Sorokvasha (guitar, vocals), Vladimir Troyanovskiy (bass) and Denis Belyaev (drums) onboard SKHOLASTIKA finally records two demo tapes. Straightforward Russian-language material of these tapes hits the taste of fans of dashing thrash metal. In 1996 the band takes part in Hard Rock Corporation festival in Moscow. During the same period one song of SKHOLASTIKA is released on iconic "Thrash Tvoyu Mat! Vol. 4 (Thrash holy crap! Vol. 4) compilation. Despite its iconic status at a local level, for a variety of reasons by the early 21 century the band slowly but surely withdraws into the shadows. However by the end of the noughties, after waiting the crisis of the genre out and refreshing the line-up SKHOLASTIKA announces reunion. The quartet soon becomes a trio that recovers nearly lost and invades new territories. After numerous shows in Bryansk, Smolensk, Moscow, St Petersburg, Tula, Kaluga, Yaroslavl, Kiev and other cities of former Soviet Union the musicians consolidate their success by releasing a 4-track demo in 2013. SKHOLASTIKA has not wavered from its ideals, but outlined the bias to sweepy and thick sound. By the end of 2013 the band presents its debut full-length album titled � just like the previously recorded demo � ��Na Abordazsh!" (Begin the grappling!). In 2018 this album is released in CD format by More Hate Productions, Narcoleptica Productions and United by Chaos. Vladimir Sorokvasha � guitars, vocals.